[+] Aerial photo of Telluride, Colorado, from 37,000 feet. I made sure to get a seat on the righthand side of the plane today for my flight from San Diego to Denver. Having flown this route many times, I knew that the south side of the plane always gets a great view of the northern San Juans, including Ouray and Telluride. 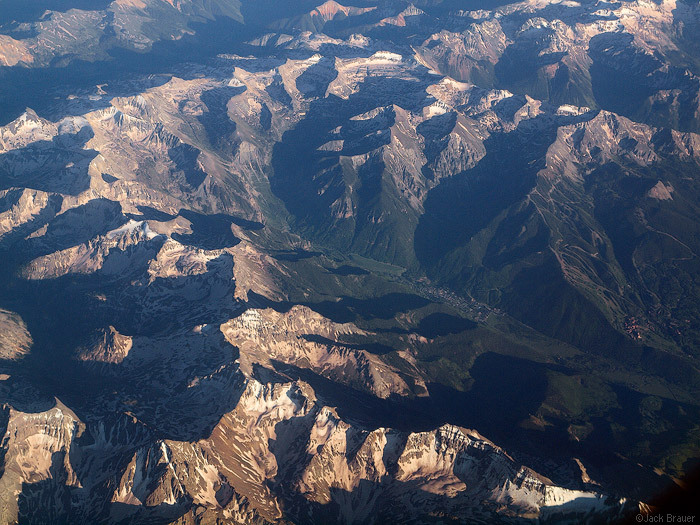 Especially in the LARGER VERSION of the above photo you can see the town of Telluride nestled in its box canyon. You can see the slopes of the ski area above town, and Mt. Sneffels (14,156 feet) is the peak at lower left bottom. [+] Shortly after the previous shot, I took this one, looking directly south up the Uncompahgre Valley, which cuts into the heart of the San Juan Mountains. The town of Ouray is deep in the center of this valley, though it’s too much in shadow to be seen clearly here. Red Mountain Pass curves up towards the right to Silverton and eventually to Durango. The Needle Mountains are the rugged and slightly snow-capped peaks way off in the distance. This photo, especially the LARGER VERSION shows what an immense ocean of mountains the San Juans are. Here’s a better photo of Ouray from the air that I took from the same plane route last October. Posted in Colorado and tagged Colorado, San Juans, Sneffels on June 23, 2009 June 10, 2013 by Jack Brauer. ← Previous: "Ouray in June"
Excellent Jack, thanks for sharing. I’ve never seen such a great shot as this, I’ve been all over this area and it’s great to see it from this vantage. Again, thanks! 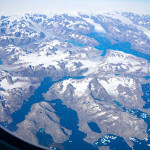 I really love these aerial shots…great job. Not a whole lot of snow left, it seems. Very cool, Jack. 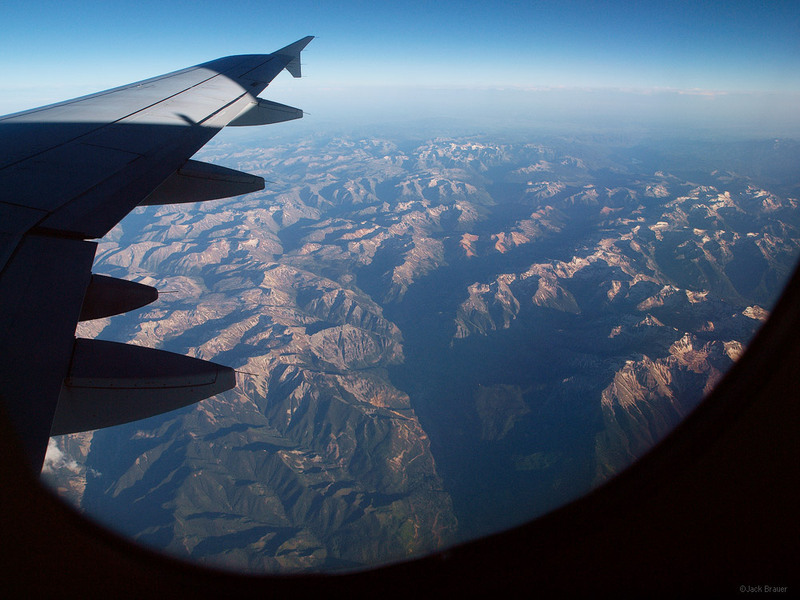 I like the ocean of mountains reference – like so many waves from the air. Now I understand why ravens soar! Hey Jack, thanks for the reference point with Sneffels. If you follow just a little bit up and to the left (11:00 position), you can see Stony Mountain poking out of the shadows, which means everything in-between would be Yankee Boy Basin. Great stuff! These photos are amazing!!! I put a link on my Telluride Daily Photo to these.